As the marine engine consumes fuel, the fuel bladder collapses. When all the fuel has been burned up by the marine engine, the bladder rolls up and stows out of the way. 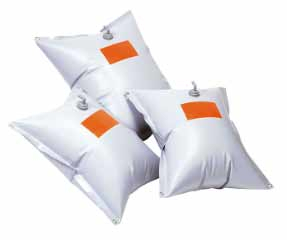 Depending on the brand, fuel bladders are available from about ten gallons to hundreds of gallons capacity. As useful as they may be, it is vitally important to use flexible fuel bladder tanks safely. For example, notice how the sales literature describes diesel fuel bladders. Conspicuously absent is any mention whatsoever of gasoline. That is because a bladder bulging at the seams with gasoline will void your boat's insurance policy. The worry is that on a long passage constant wave action could chaff a hole in the nitrile/neoprene-coated nylon skin. While 50 gallons of diesel fuel sloshing around in the bilge qualifies as an environmental nightmare, volatile gasoline could vaporize and cause a fire at sea. It would not be pretty. Chaffing is also the reason why a diesel fuel bladder ought to be positioned inside a leak proof enclosure and the bladder firmly secured to minimize motion (notice the bronze grommets set at all four corners). Installing a flexible tank inside a box will contain a spill, be it just a few drops, or a deluge, and the deck won't become as slippery as an ice skating rink. Even more critical, with the spill contained it is possible to salvage the fuel. Simply bucket the sloshing liquid out of the box, pour it through a Baja Filter to extract junk and water and then dump it into the main tank. As for the location of the containment box, keep in mind the weight of the extra fuel load could negatively influence the boat's center of gravity. Handling and seaworthiness may suffer. Just like the bank of house batteries, it is best to mount fuel bladders as low to the keel as possible.